The musical 20th Century Boy is inspired by the music and life of T Rex's Marc Bolan featuring his songs including Ride a White Swan, Metal Guru, Get It On, I Love to Boogie, Children of the Revolution and of the title track 20th Century Boy. It premiered in 2011 at the New Wolsey Theatre in Ipswich, ran at The Belgrade Theatre in Coventry in September 2012 and is now due to go on tour next year again directed by Gary Lloyd. 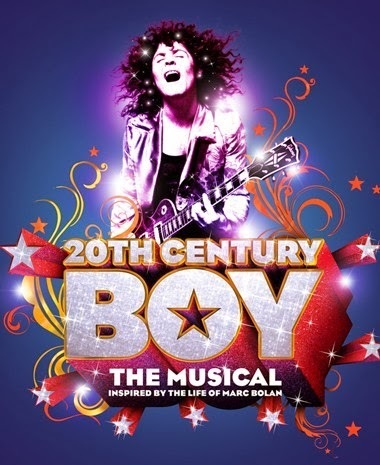 The first dates for the musical 20th Century Boy are now on sale: 22nd- 26th April Manchester Opera House: 28th April-3rd May Birmingham Alexandra: 12th-17th May Bristol Hippodrome: 28th May York Grand Opera House: 9th-14th June Woking New Victoria with more dates and casting to follow.